This version is completely customizable in the sense that you can remotely mount the siren amplifier in a remote location in your cab. Then, run the wire from the amplifier to the place where you would like your control switches to be mounted. You can mount the siren underneath the passenger seat, hid beneath the console or any other place you found that you wish! There are two main parts to every emergency vehicle warning equipment systems: lights & sirens. Typically you have a siren to produce the sound, and a switch box to control the lighting. Sirens that included switch boxes are too expensive for the volunteer firefighter customers. Carson has fixed that! This siren has 2 switches so you can control your dash lights, deck lights, and led grill lights. With a lighted control switch, you can tell whats on, what's not in the darkened cab while responding. But that's not what makes this siren so special. We all love the sound of a fire truck right? No one has come close to ever reproducing that sound in an electronic version. Until now. This siren has a mechanical tone that will move traffic. Carson Sirens have really done a great job at making the mechanical tone sound a way that will move traffic and provide that classic fire truck sound. Finally - the price. You would expect this siren to cost hundred more. But at The Public Safety Store - we believe in passing a great price on to our customers. The price of this siren really is at a point where volunteers can afford and still get a fire siren that will do the job! Designed for a volunteer firefighter, the SC-1012 Volunteer 100-watt remote siren with light controls offers complete versatility. The siren provides flexible placement of the remote switch panel and amplifier. The remote switch panel features two separate 3-position rocker switches that allow you to select between wail, yelp, manual, and mechanical tone. The SC-1012 siren includes a momentary rocker switch for air-horn and phaser with the European HiLo/two-tone sound as an optional substitute. The Horn Ring Cycler (HRC2) function of the siren cycles through the tones with the vehicles horn to to enable the driver to have hands-free. To control emergency lights the siren also includes two lighted rocker switches. This siren is designed to work with a 100-watt speaker and ensures you the strength to get you where you need to go and be heard like one of the big fire trucks. The remote panel may be mounted with holes in the top or bottom. The siren tones may be changed or disarmed using an internal Dip switch. An output indicator light is on the face of the remote amplifier for diagnostic purposes. The light controls are capable of switching up to 20 amps. The siren is LED backlit and is installed using heavy duty screw down terminals for power and detachable connectors for the speaker and lights and remote switch panel. The amplifier and light controls are fused separately on the back of the unit. 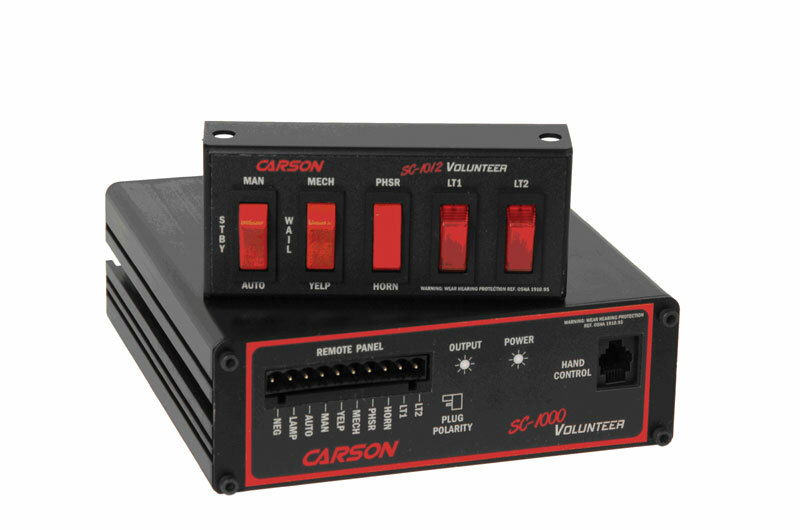 As with all Carson Sirens products, the SC-1012 Volunteer is backed by a no-hassle 5-year limited warranty.